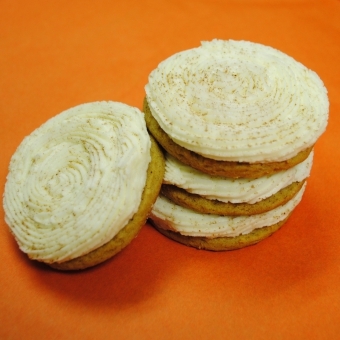 Our Pumpkin Spice cookie is a very moist, soft pumpkin shortbread cookie topped with our extra creamy Cream cheese frosting. Its creamy like a pumpkin pie, moist like a pumpkin bread and oh so decadent like a pumpkin triffle all wrapped up in a cookie. Is it fall yet? Size: -- SELECT -- Pumpkin Spice Sprinkle 10 ct.Pumpkin Spice Sprinkle 20 ct.Pumpkin Spice Sprinkle 30 ct.Pumpkin Spice Sprinkle 60 ct.Pumpkin Spice Sprinkle 90 ct.